...when your plow is a pencil and you're a thousand miles from the [grain] field." Driving through the south Willamette Valley this time of year, roadside fields make it clear that there is something more to local agriculture than the vibrant fruits and vegetables of farmers market fame. While some stretches of road run you past diverse row crops, hoop houses, and perhaps a wandering barred rock thinking about crossing the road, much of what flies past the windows is not what your everyday Saturday Market shopper has in mind when it comes to local farms. Center pivots over grain for export, the distinct scent of irrigated peppermint, acres of ryegrass, filberts, sheep on clover, and the deep green of young corn are familiar to anyone who has lived in this valley for a few seasons. Sights and scents so common to the valley roads that they might not even register to the otherwise food and land-conscious driver as part of the "local farm" landscape. Maybe not organic. Definitely not small scale. Mid-size family farms such as ours, however, are a crucial piece of our area's economy, social fabric, and ecology, and we are often left standing in the rift between local food enthusiasts and corporate agriculture. This is part one in a longer series to add our voice to the local and regional food conversation. Streaker barley fresh from the field at Hunton's Farm--Streaker is a hull-less food barley type released as public germplasm by the Oregon State Barley Project. Kernel color varies from chocolate brown to tan to robin's egg blue. Responsible farming doesn't just include growing practices, or what happens once the crop is planted. For us, it starts with seed and variety selection. 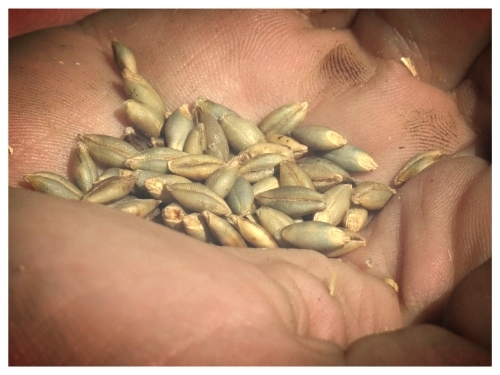 Overwhelmingly, we grow non-traditional grain without long histories of cultivation in the valley to draw on. For proof of inherent disease resistance, seedling vigor, yield, and nutritional quality, we most often turn to the plant breeders at Oregon State and Washington State Universities. The programs at these land grant schools are invaluable resources; as plant breeding becomes increasingly privatized, we are fortunate to live in such close proximity to public sector programs staffed by hard working and innovate folks who are a pleasure to be work with. Selecting strong varieties out of these programs helps mitigate the need for fungicides during the growing seasons, as we select for inherent resistance to diseases such as rust and scald. Because we grow such an array of crops on Hunton's Farm, there is no single set of growing practices applicable to all of our farm. In one case, an early season application of broadleaf herbicide may be necessary to have a fighting chance at harvest. In another, the same approach may be completely irrelevant; our growing practices change from acre to acre, crop to crop, season to season, always with an eye toward soil health and achieving the yield and quality expected by our customers. Across all of our 3,000 owned and leased acres, we practice Integrated Pest Management (IPM), which entails constant monitoring of weed, disease and pest pressure. Thresholds for action and economic damage dictate when and if we use a control strategy, and we aim to use controls that are as specific to the problem as possible with minimal impacts on non-target species and the environment. Where was this [particular grain or flour] grown? The short answer is usually, "on our farm, here in Junction City." However, with over 3,000 acres, that's a pretty big answer, particularly because our leased and owned land is a non-contiguous patchwork of fields. With quality seed selected, the next step is site selection. For each crop, we evaluate irrigation needs, ease of planting and tilling, previous crops, and the existing soil health to maximize productivity and efficiency. We also partner with neighboring farms as well as a handful of farms on the east side of the Cascades to meet demand for particular crops. Rather than seeing this as a dilution of our unique positions as "the farm, the farmer, the mill, and the miller," we see an opportunity for other farms like our own to grow high-quality food crops outside of the commodity market, providing farmers a relatively new option with grains and legumes to see profit, soil benefit, and a final product that is processed and consumed locally. Why don't you grow this [particular grain or flour] organically? The short answer to this question is demand. Our goal is to continually increase our organic acreage, but expansion is dependent on demand. We have already converted, or begun the three year process of conversion to organic on the best ground that we own, and will be looking at improving some more marginal soils if we expand our organic production. The longer answer is that sometimes organic certification is not the best choice for every crop. Regardless of whether the crop in question will be grown and marketed as conventional or organic, we pay close attention to the soil. There is a rampant misconception that all conventionally grown crops are kept on a chemical diet with no regard for soil health, which couldn't be further from the reality of our farm. In some cases, organic practices are the best fit. For other crops and other sites, the increased tillage and potential water pollution issues associated with large amounts of organic inputs are a poor choice, and we choose other techniques. Taking in to account weed competition and management options, what we know about each variety, and the marketability of the final product, we decide on an appropriate growing practice.